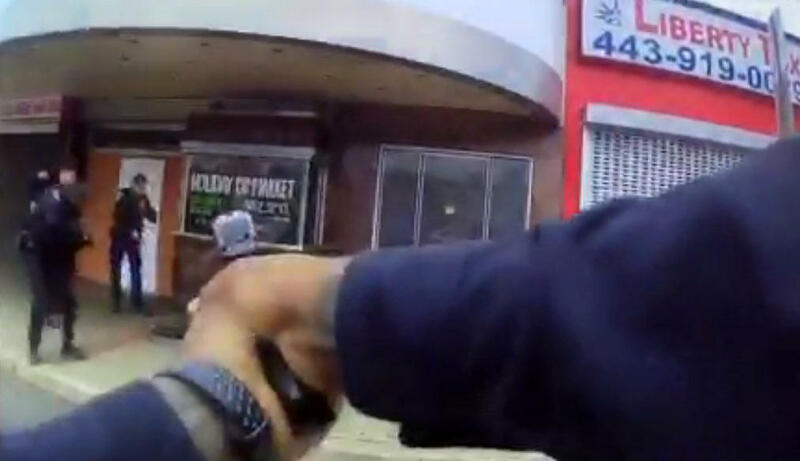 BALTIMORE -- Baltimore police released the first body-worn camera footage from a police-involved shooting on Wednesday, CBS station WJZ-TV reports. “Keep breathing, buddy,” one officer says in the video to a 48-year-old man as CPR is performed on him. The suspect was in stable condition at a hospital with what were described as non-life threatening injuries. The shooting occurred Friday morning. Police identified the officers involved as Officer Gary Brown and Officer Supreme Jones. Police spokesman T.J. Smith said Jones was the officer performing CPR on the suspect in the recording. The video can be viewed in its entirety below. Warning: This video contains graphic imagery and language. Authorities said the officers first attempted to bring the man, who was wielding knives around 9:30 a.m. Friday, under control with a Taser. “I’ve got one life to live, I’m going to give it,” the man can be heard saying on the bodycam recording. When the man continued to behave erratically, Brown and Jones shot him multiple times. Police Commissioner Kevin Davis said at a press conference Wednesday that the man has a history of mental health issues and had another episode recently that indicated such problems. Smith said the man has a history of suicide attempts. According to WJZ-TV’s media partners at The Baltimore Sun, there have been 11 shootings by Baltimore police this year, but authorities have said none until now had been captured on body cameras. About 600 Baltimore police officers have had the cameras as part of their uniforms since the rollout of the $11.6 million program began in May.